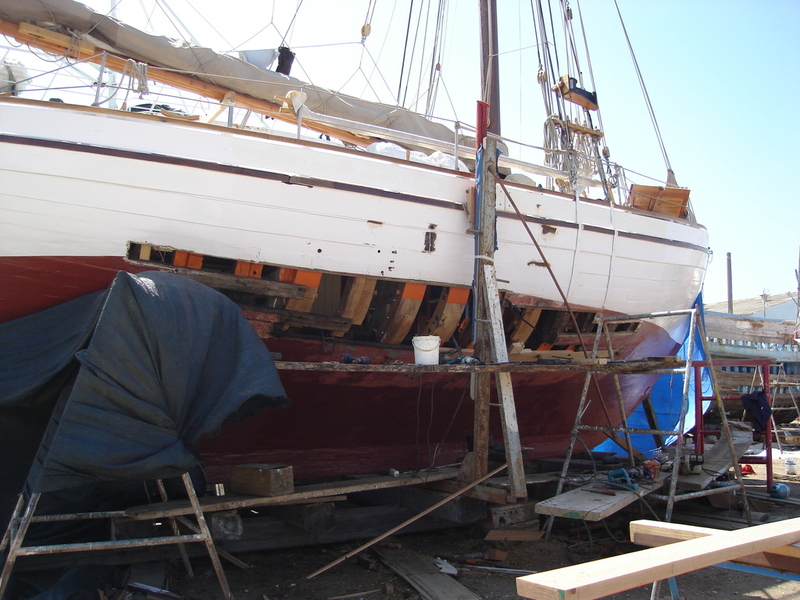 We knew there would be a few planks to replace and we had planned to be out of the water for about a month, maybe six weeks if the weather would be nasty, but in the end it was two full months Eos stayed on land. There was hardly any rain to speak of, just that the work turned out to be quite a bit more. 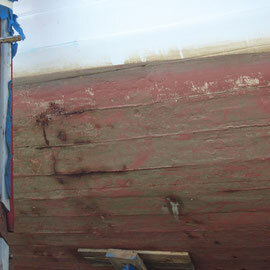 shows how good the planks still were. 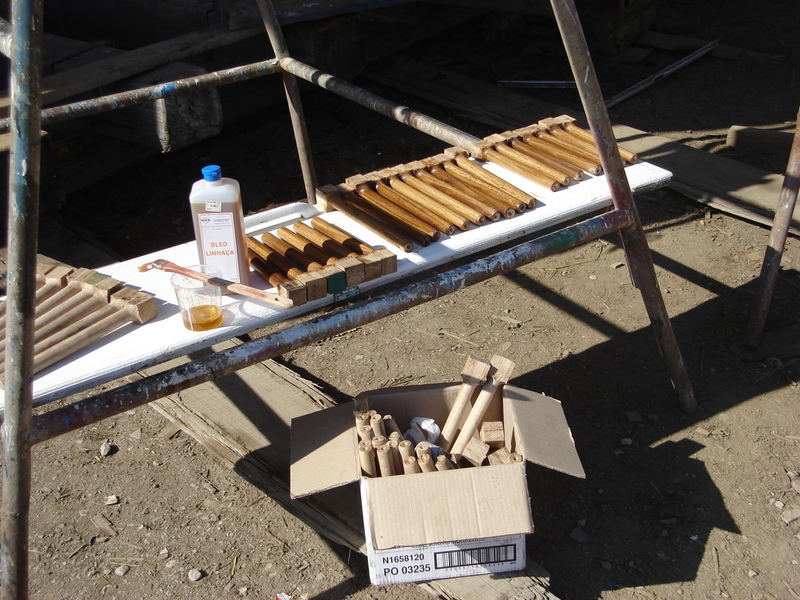 We never thought the frames and so many of them would be in such poor condition. How could this have happened? 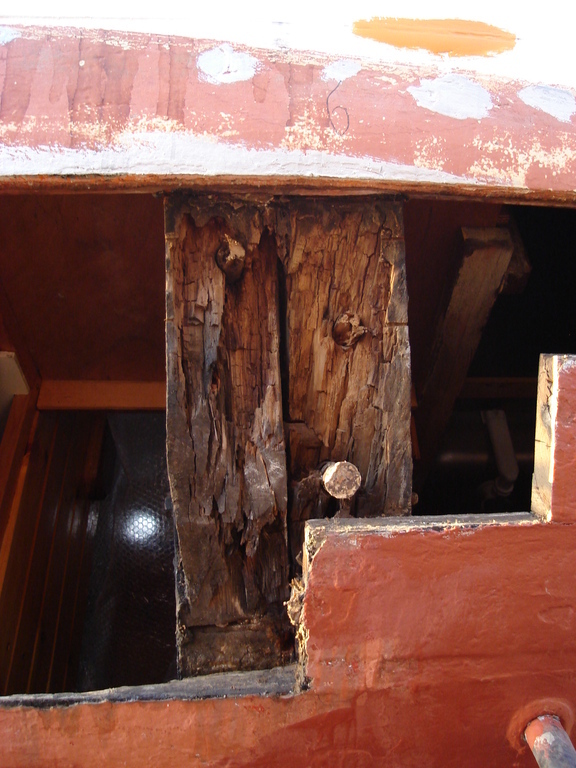 The most probable explanation is that a lot of dampness must have got between frames and planks when Eos was still a fishing boat and the centre of the boat – where the bad frames were located – was used as a hold. 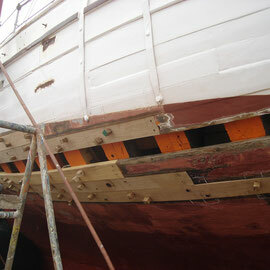 On the other side of the hull we had done some replacements of planks and frames already several years ago. 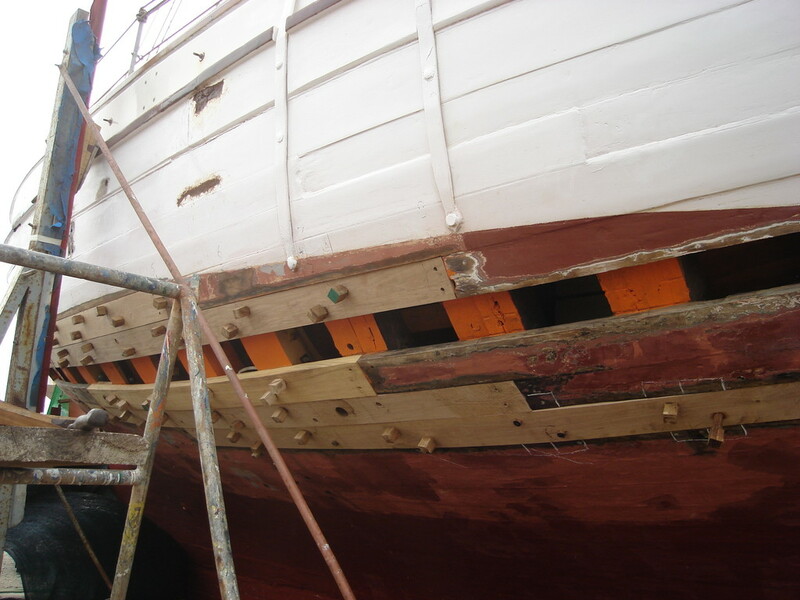 At that time we explained their bad condition to the fact that Eos had for many years been moored with het starboard side along a pontoon and her port side exposed to the sun. 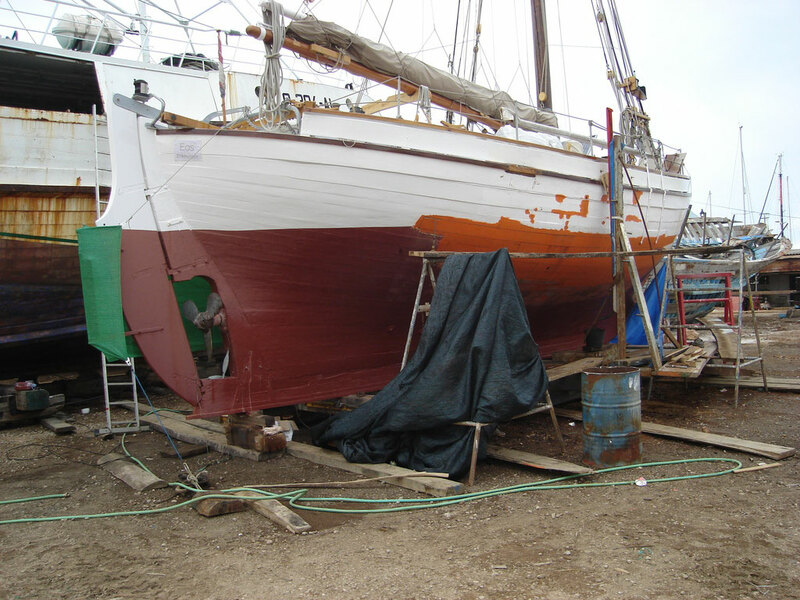 We contemplated doing an epoxy repair on the frames, but now being in wooden-boat-repair country we decided to have the yard do some work for us. 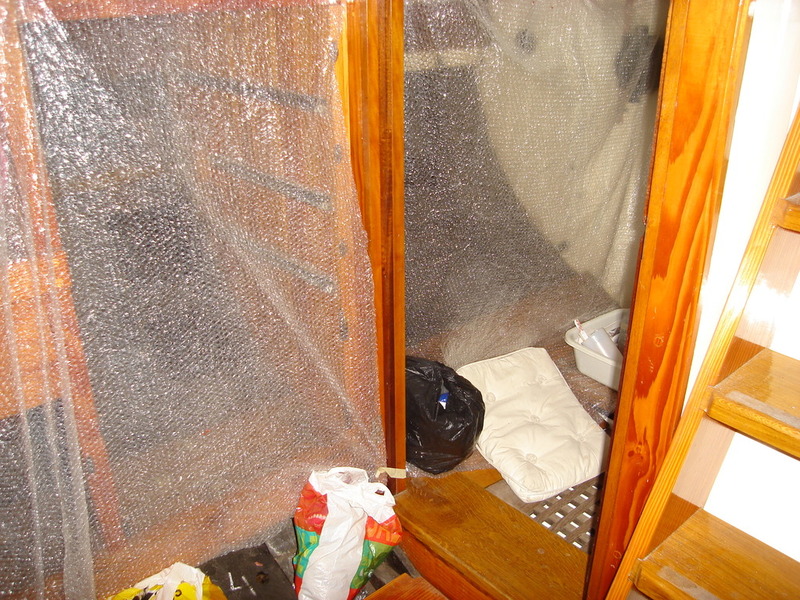 Not having made any previous appointment with the yard for having work done, it took a couple of weeks before they could spare a carpenter. But then we got two of the best and they did a fine and really fast job. 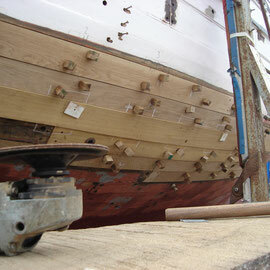 The three oak planks plus the two spare we had ordered before turned out not to be enough. 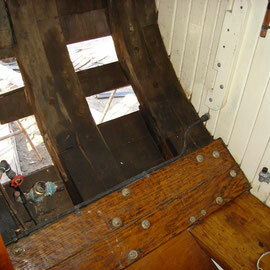 Six new planks and six new frames were put in. An iroko plank between all oak planks, iroko frames instead of pine and let's not mention some epoxy repairs here and there; yes we're cheating a bit on the historical tradition. 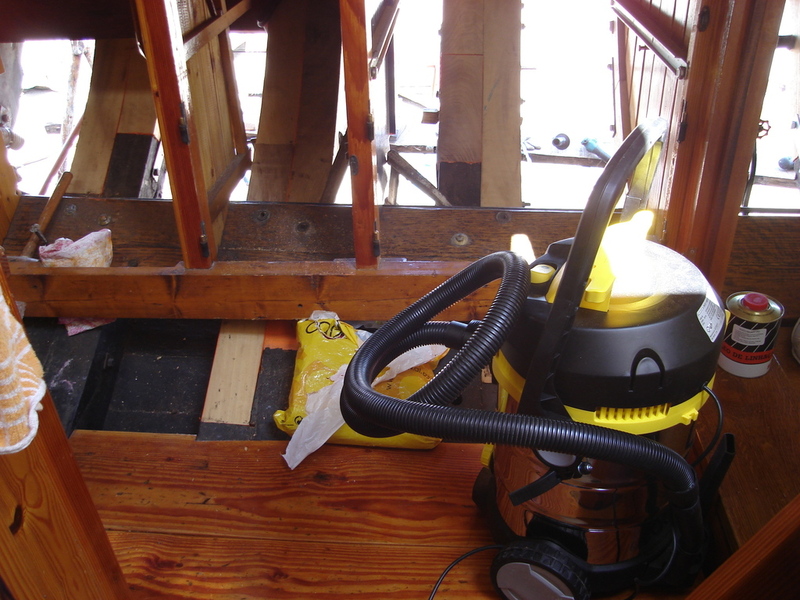 To get the new pieces of wood in place, we had to take out the whole interior of the bathroom, most of the kitchen and a bit of the electric panel in the aft cabin. 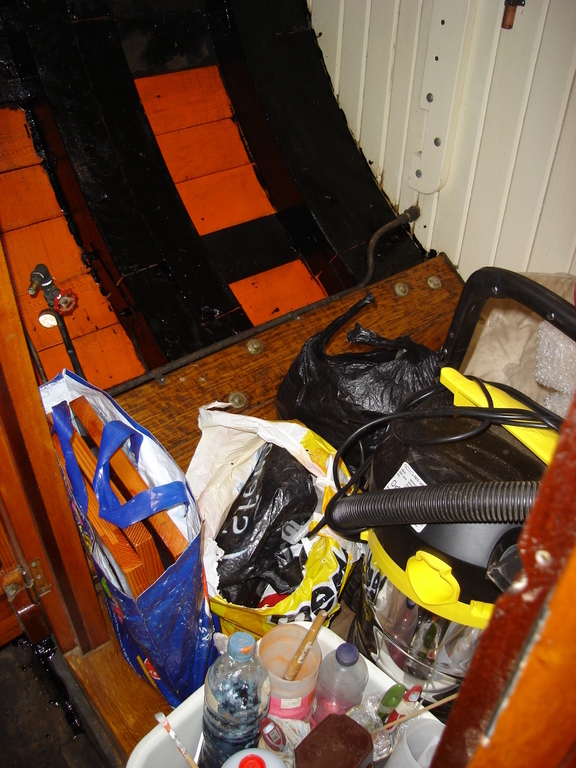 Well, the bathroom we couldn't use anyway on the hard, so that was no problem, just put everything out on deck and make use of the situation to give all the hoses a good clean-out. Half of the kitchen stores we put on the sofa, leaving just room enough for ourselves to sit. 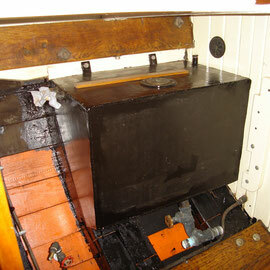 But it got a bit annoying when also the plank through which the sink outlet went was taken away. 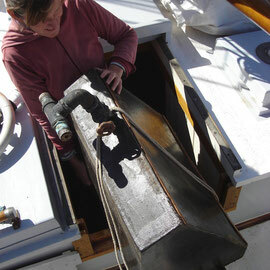 Normally when we are on the hard, we have a hose stuck in the hole of the sink outlet with a bucket underneath to prevent all the dirty dishwater running down the hull, but now we had nothing under the drain and everything would just run into the bilge. 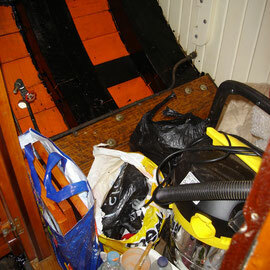 Which meant having a washing-up bowl in the sink, carry that up the companionway out on deck when full, empty it in a bucket, lower the bucket when full on a rope down to the ground, climb down the ladder, carry the bucket down to the seafront to empty it, back to the boat, back up the ladder, and this several times a day. Some way of getting fit! 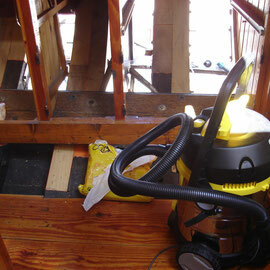 We bought a wonderful big new vacuum cleaner to gobble up all the sawdust and bits and pieces of wood. 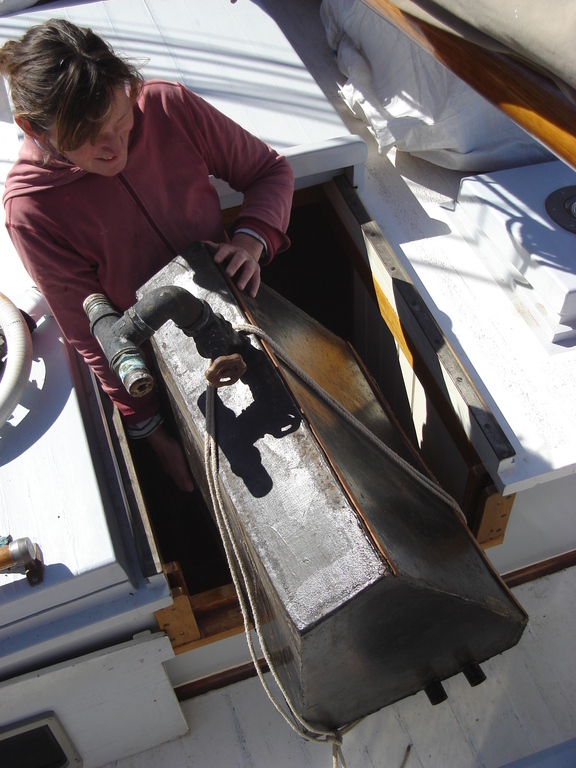 Thinking we would sell it again after all the work is done, but it is such a wonderful thing for cleaning out the bilges that we'll hang on to it a bit longer until we get too annoyed with it taking up so much space. 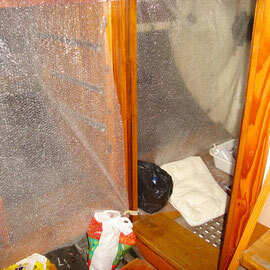 Lots of ventilation. But at night we would close the curtains. 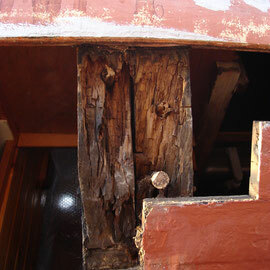 Not only with the iroko plank and frames we had been cheating, also with the trunnels (wooden nails) we had to compromise. Traditionally juniper branches are used, and before we had been using black locust as a very good second choice, but this far south on the globe we had to make do with oak. The big problem was how to get them made here. Scouting the industrial estate we came across a workshop with a lathe and they were willing to work with some other material beside steel. Not cheap, but we were happy enough having found a solution. 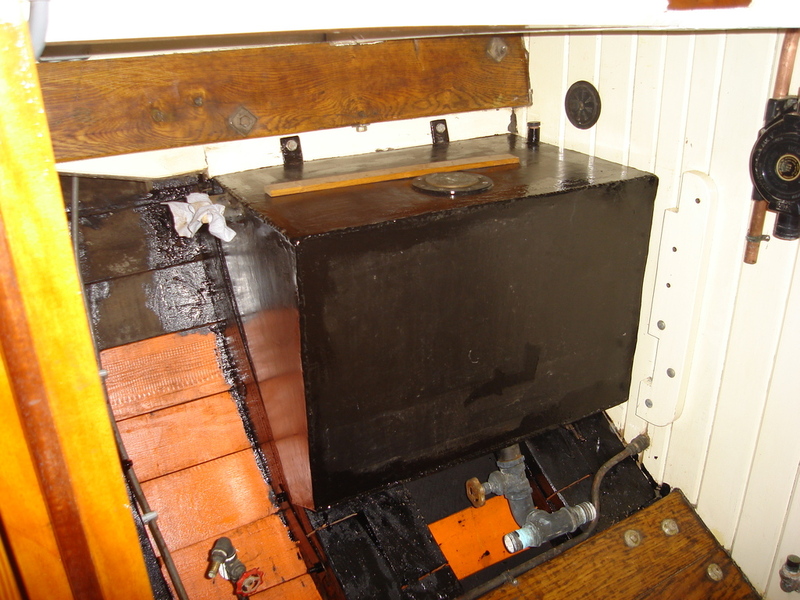 Later we went to the same workshop to have some burners and fittings for the paraffin stove repaired and we were very pleased with that work done as well. 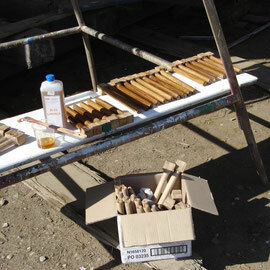 with linseed oil. 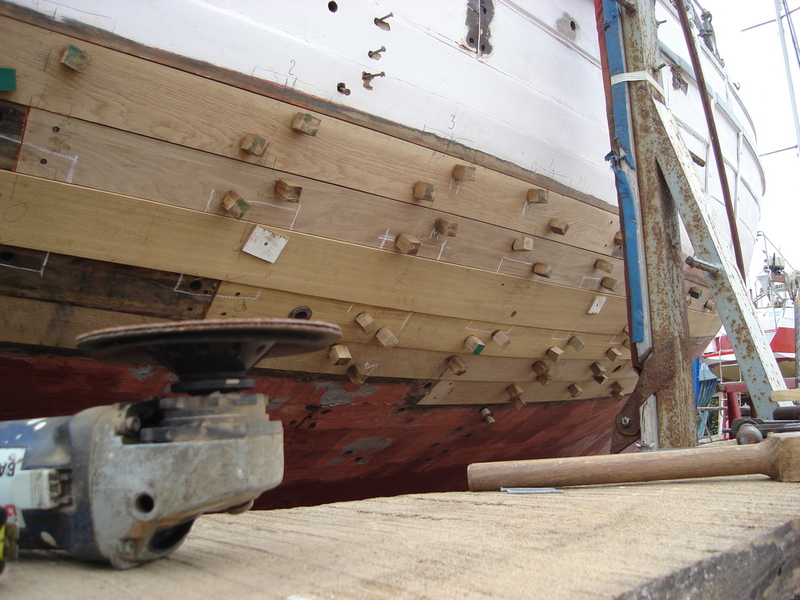 were sawn off. tank out, so we would know which way it had to belongs. 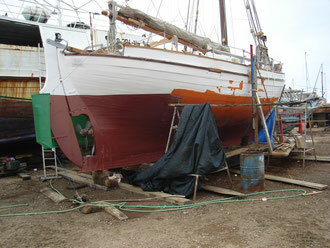 some sanding, filling and painting to do. 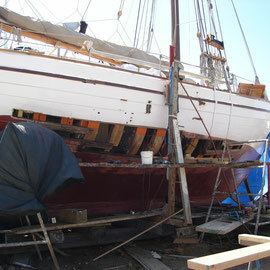 While Peter was busy on the carpenter side, I made myself useful with all the painting and antifouling. 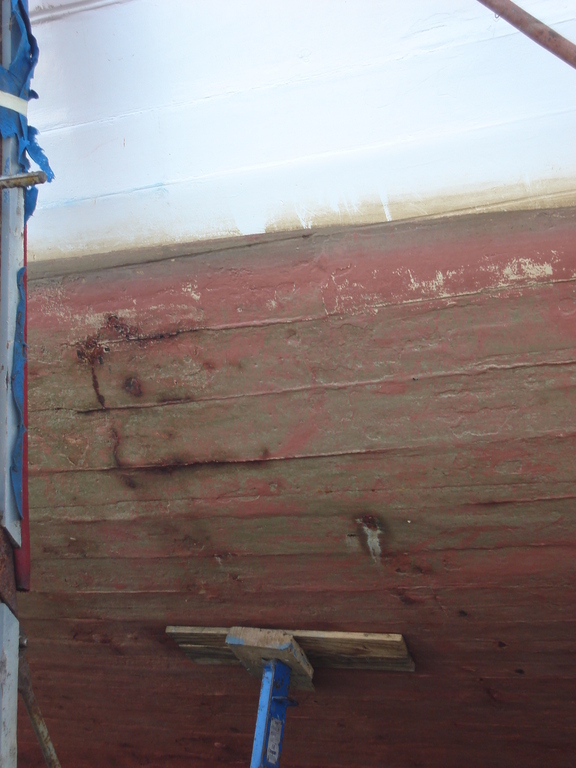 Knowing we would be ashore for longer than usual, I redid the topsides and also took on the job of painting the underside of the railing, the coaming planks on both sides and the posts to which they are attached. 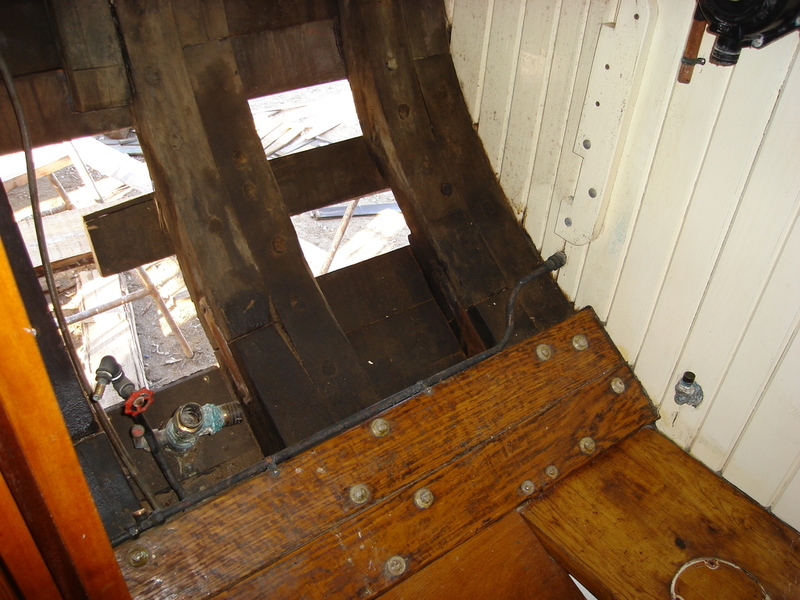 I had wanted to make the job easier by taking the planks off, but after having already undone several of the screws – and broken and bent a few in the process – I realised I would also have to undo the chainplates that are fixed outside the railing. That proved just a bit too much work, so instead of painting under the railing from the outside standing at a comfortable hight on the scaffolding planks, I did the work on my knees with my bum in the air and head on the deck to be able to see if I was applying enough paint under the railing. Another way of fitness exercise but quite a bit of grumbling this took.